White long tapering roots, full of crunchiness and healthy minerals. I am praising the humble white radish, mooli or moora as its called in Gujarati. It is the most under appreciated vegetable in spite of all its health benefits. Eating radish regularly helps to cleanse the kidney, helps to sooth sore throats, fights the flu virus,aids digestion, helps to get rid of toxins from the body, fights cancer,is a natural coolant and keeps the body hydrated. I love making moora ni bhaji whenever its available. I find that whenever its Ramadhan month, the white radish is available in abundance. Many of the locals can be seen biting into the radish when they break their fast. In the Gujarati cuisine, we tend to use both the root and leaves to make a sabji , shaak or vegetable to go with nice hot rotlis. I also love using radish to make theplas and mooli parathas. I made this shaak when my sister and her family came down from UK recently and I was pleasantly surprised to know that my niece loves the shaak. Most kids do not like unusual vegetables. Mix the chana flour, red chilli powder and pinch of turmeric in a small bowl. Keep it on the side till required. Peel the radish. Wash the radish and leaves along with the stalk thoroughly. Shake of the extra water and chop both finely. Heat oil in a wide pan over medium heat. 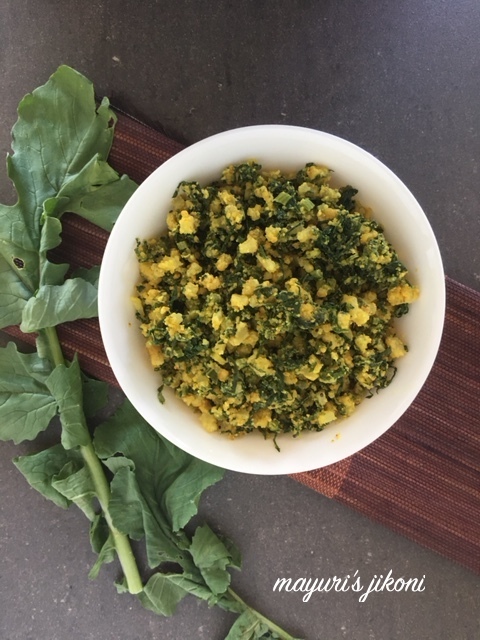 When it becomes hot, add the methi seeds, mustard and chopped garlic. Reduce the heat to low. Add ginger and chilli paste. Mix for a second or so and add the turmeric powder. Immediately add the chopped radish, stalk and leaves. Add the salt. Mix it well. Cover and let the vegetable cook over low heat till done. Sprinkle the flour mixture over the cooked vegetable. Cover and let it cook for 2 to 3 minutes. Take the pan off the heat, mix the vegetable and serve. Cut the stalk and leaves finely. You do not need to add any water as the vegetable will let out water while cooking. Add little salt initially as the vegetable has its own salt. Add more if required. Serve the vegetable with a dal and roti. On its own it is a dry vegetable.